So I've shared one of the two bathrooms with you and its looking promising I think. 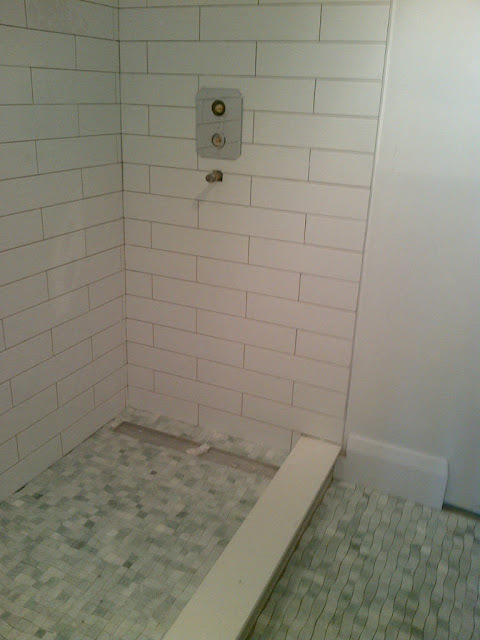 We went with a safe tile choice there on the carrara herringbone. On the other washroom I was more daring and I'm worried I may have missed the mark - but I'm not sure. Here's a bit of the history: I saw the following ming green 'illusion' tile when we first started shopping and fell in love. And when I say love I mean real love. I'd meant to buy a white carrara 1" hex tile when I went in but I couldn't shake this tile from head. I slept on it for 3 weeks because I knew this wasn't a traditional choice. I didn't even post about the tile because I loved it so much and you know how hurt you can feel when someone advises against things you love. Hubs thinks the whole thing looks great - spa like. But is he saying it to make me happy and less worried? Hope things are going well for you out there. I can see why you fell in love, that green tile is fantastic! I've never seen anything like it before. I also think it will all be fine once the glass and baseboards are in. I think the simple white tiles are perfect. If you did anything else it would take away from the green tile. Let that be the star and it will be a gorgeous bathroom.